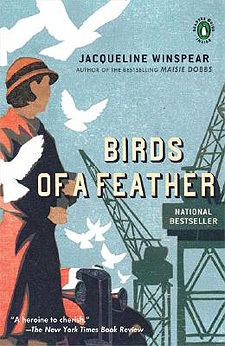 Maisie Dobbs has been hired to find the missing daughter of wealthy grocery store magnate. Problem is, that Charlotte really doesn't want to be found; she feels she has found the sanctuary and peaceful life that she has been seeking. Maisie agrees to find the daughter, but there is a catch, the father must agree to work with her to determine how to mend the shattered father/daughter relationship. While investigating this case, Maisie realizes that the relationship with father has become one of familiarity rather than of deep care and concern for each other. Not only must she find a missing girl and mend that family, she must also mend her own. I listened to the BBC Audiobooks America version of this book. In fact, I enjoyed it so much that I listened to it twice. I was only going to re-listen to the opening chapters, but once I got started I had to continue. It was read by Kim Hicks, 10 hours 21 minutes. The story was enhanced by the return of handy man Billy Beale. He is now Maisie's assistant and he really does add more to her firm, far beyond answering phones and doing errands. He provided balance to Maisie's formal approach to her cases. He sees the cases through the eyes of the common man and his every day experiences. I am looking forward to the next book, Pardonable Lies, to find where Maisie's romantic interests lead her. I find that Maisie Dobbs and Billy are very comfortable people to spend my time with. I can imagine the conversations we'd have over tea should they manifest as flesh and blood. Oh well, so much for vacation time imaginings. Thanks to author Jacqueline Winspear for the use of the cover image. Loving this cover. I know lots of family and friends who also love these books, perhaps I'll get round to reading some of them one day.